"I recently did a go-around at night and scared myself. How can I best control the airplane when performing this maneuver?" - Stuart N.
"Night go-arounds and missed approaches have the potential to be dangerous maneuvers for the unwary. 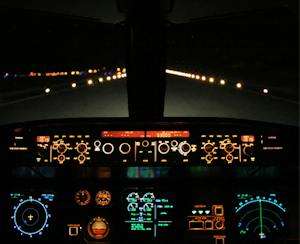 The problem occurs in situations where the go-around is initiated in poorly lit terrain with poor outside references at night, when the aircraft attitude cannot be controlled precisely. This can lead to a descent into dark terrain or a steep climb leading to a stall. Anticipation of this situation is a key factor in avoiding flight into terrain or a stall. Be prepared to go directly to your instruments when initiating a go-around or missed approach at night. Use your attitude indicator and airspeed indicator to properly position the nose for a climb as you add power. This is another good reason to be proficient at basic instrument skills. Instrument proficiency is gained through practice."